From the fear of being suspected, Deliver me, O Jesus." This remarkable and famous saint first learned about the ascetical life in the Egyptian Thebaid. He then went to the Jordan and there founded a community in which there were seventy monks. This community still exists today. He instituted a special Rule for his monastery by which the monks spent five days in their cells weaving baskets, reeds and rush mats. They were never alllowed to light a fire in their cells. For five days they ate only a little dry bread and dates. The monks were required to keep their cells open so that when they went out, anyone could enter and remove whatever he needed from their cells. On Saturdays and Sundays they gathered in the monastic church. They had a common meal with a few vegetables and a little wine to the glory of God. Each monk would then bring in and place before the feet of the abbot that which he had made during the past five days. Each monk had only one robe. St. Gerasimus was an example to all. During the Great Lenten Fast, he did not eat anything except what he received in Holy Communion. On one occasion, he saw a lion roaring from pain because there was a thorn in his paw. Gerasimus drew near to the lion, crossed himself, and removed the thorn in the animal's paw. The lion became so tame that he returned with Gerasimus to the monastery and remained there until the elder's death. When Gerasimus died, the lion succumbed from sorrow for him. Gerasimus attended the Fourth Ecumenical Council in 451 A.D. during the reign of Marcian and Pluceria. Even though in the beginning, Gerasimus leaned toward the Monophysite heresy of Eutyches and Dioscorus, he was a great defender and champion of Orthodoxy at the Council. St. Euthymius dissuaded him from this heresy. Of all the disciples of Gerasimus, the most famous was St. Cyriasuc the Recluse. St. Gerasimus died in the year 475 A.D., and was translated into the eternal joy of his Lord. THE HOLY MARTYRES PAUL AND JULIANA; Paul wnd Juliana were brother and sister from Ptelemais in Phoenicia. They were brutally tortured for the sake of Christ by the Emperor Aurelius and were finally beheaded. Before their martyrdom, many of their miracles were manifested, and were witnessed by many pagans. Through these miracles, many of the pagans were converted to the Faith. 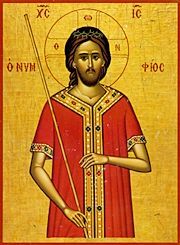 Several of these were beheaded and received their wreaths in the year 273 A.D.
SAINT JAMES THE FASTER; He lived in the sixth century. He was so perfected in pleasing God that James scured the most gravely ill through his prayers. But the enemy of mankind lured him into great temptations. At one time, an immoral woman was sent to him by some scoffers. She misrepresented herself to James, pretending to be crying yet all the while luring James into sin. Seeing that he was going to yield to sin, James placed his left hand into the fire and held it there for some time until it was scorched. Seeing this, the woman was filled with fear and terror, repented and amended her life. On another occasion, James did not flee from his temptation, but rather he succumbs to a maiden, who was brought as a lunatic by her parents to be cured of her insanity. He, indeed, healed her and after that, sinned with her. Then in order to conceal his sin, he killed her and threw her into a river. As is common, the steps from adultery to murder are not too distant. James lived for ten years after that as a penitent in an open grave. At that time there was a great drought which caused both people and live-stock to suffer. As a result of his prayers, rain fell; James knew that God had forgiven him. Here is an example, similar to that of David, of how twisted is the demon of evil; how by God's permission, the greatest spiritual giants can be overthrown, and through sincere and contrite penance, God, according to His mercy, forgives even the greatest sins and does not punish those when they punish themselves. "The enemy tries to produce an illusion of some spiritual experience within us, offering us mirage instead of the real thing--unruly burning instead of true spiritual warmth, and instead of joy, irrational excitement and physical pleasure which in turn gives rise to pride and conceit and he even succeeds in concealing himself from the inexperienced behind such seducements, so they think his diabolic illusion is really the working of grace. "O God of gods and Lord of lords, the Creator of the flaming ranks and Artificer of the bodiless powers, the Artisan of things heavenly and earthly, whom no man has seen nor is able to see, before whom all creation trembles and fears, who cast down to earth that archangel which at one time became haughty and because of disobedience forfeited his function together with all the angels that fell away with him, becoming demons, who hurled them down into the darkness of the abyss of tartarus: Grant that this deliverance, which is being carried out in your awesome Name, become efficacious by the fear of this the leader of evil and of all his ranks which have fallen with him from the light-bearing heights and drive him into banishment and command him and his demons to utterly depart, so that no harm might be worked against your sealed image. But let those who are sealed receive the strength that they may tread upon serpents and scorpions and upon all the power of the enemy. For your all=holy Name is praised and magnified and glorified by all breath, of the Father and the Son and the Holy Spirit, now and ever, and unto the ages of ages. Amen"
" I have no life, no light no joy or wisdom, no strength except you, O God. Because of my unrighteousness I dare not raise my eyes to you. But you said to your disciples, "Whatsoever you shall ask in prayer believing, you shall receive" and "Whatsoever you shall ask in my name, that will I do." Wherefore I dare to invoke you. Purify me from all taint of flesh and spirit. Teach me to pray aright. Bless this day which you give unto me, your unworthy servant. By the power of your blessing enable me at all times to speak and act to your glory with a pure spirit, with humility, patience,love, gentleness, peace, courage and wisdom; aware always of your presence. Of your immense goodness, O lord God, show me the path of your will, and grant me to walk in your sight without sin. Preserve me from every word or deed that corrupts the soul; from every impulse unp-leasing in your sight and hurtful to my fellow man. Teach me what to say and how to speak. If it be your will that I make no answer, inspire me to keep silent in a spirit of peace that cuases neither sorrow nor hurt to my fellow man. Establish me in the path of your commandments and to my last breath let me not stray from the light of your ordinances, that your commandments may become the sole law of my being on this earth and all eternity. Yea, Lord, I pray to you, have pity on me. Spare me in my affliction and my misery and hide not the way of salvation from me. Yea, Lord, by your Holy Spirit, teach me good judgment and knowledge. Grant me to know your truth before I go down into the grave."